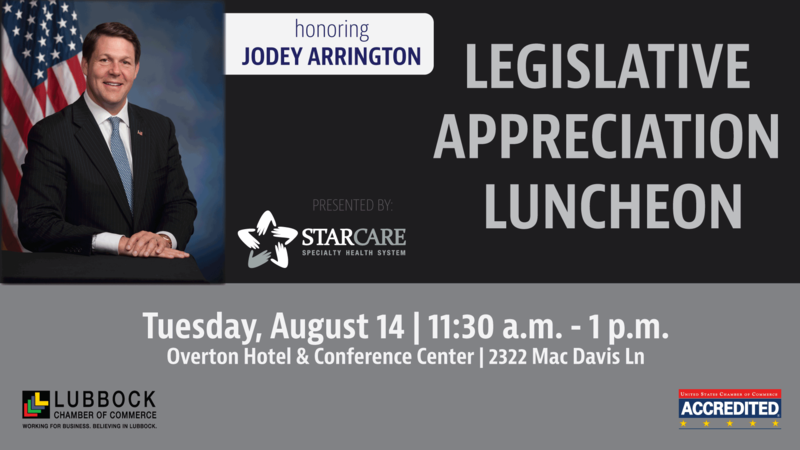 The Lubbock Chamber of Commerce will host a Legislative Appreciation Luncheon sponsored by StarCare Specialty Health System at 11:30 a.m. on Tuesday, August 14, 2018 at the Overton Hotel & Conference Center. The featured guest will be U.S. Representative Jodey Arrington. Reservations are required and are $50 each. Chamber members get a discounted price of $40. Contact the Lubbock Chamber at (806) 761-7000 to reserve your seat no later than Tuesday, July 31.